Blog posts reflect the views of their authors. Parking lot or people destination? After the sale of the old St. Joe’s Hospital, Sudburians are left with the question of what to do with a 100,000 sq. ft. asphalt parking lot on the shores of Ramsey Lake. This is a great opportunity to turn this land into something all citizens can use today and for many generations to come. If you look back to the City’s decision to create the Jim Gordon Boardwalk on the shores of Ramsey Lake, many people complained about the cost, that it wasn’t needed and wouldn’t be used. But if you Google Tripadvisor for Sudbury, you’ll see that the most highly ranked tourist destination in Sudbury after Science North is the Bell Park Boardwalk. The boardwalk is important for tourism but is also well used by and benefits all Sudburians. The boardwalk promotes healthy living and exercise, connection to the lake and land and is free for everyone to use. Quite a success story. But a parking lot? It certainly will never become a tourist attraction on TripAdvisor. A parking lot is for cars, period. And since one third of Sudburians do not have access to the use of a car (according to the Sustainable Mobility Plan, 2010), how can we say leaving it as parking lot is for the benefit of all Sudburians? By allowing excessive parking to remain at the old hospital site, we are encouraging the use of cars instead of transit, walking and cycling. Transit shuttles could be used for all major events at Bell Park and it’s a better way to move lots of people anyway. Let’s switch to more sustainable forms of transportation. The shift is happening in cities around the world so let’s get on board. And what about the long term impacts should we decide to keep the parking lot? Cars are dirty and release pollutants. Also, atmospheric phosphorus comes down with rain, which washes all these pollutants directly into the lake to an area along the shore that is about 700m from the drinking water intake pipe near David St and to within 400m of the Main Beach, which was designated, in 2015, as the only Blue Flag Beach in Northern Ontario. A cocktail of oil, grease, heavy metals and phosphorus currently flows directly to the lake from the parking lot and into our drinking water source, our beloved lake and one of our main tourist attractions. Parking lots are also heat sinks. The asphalt warms the rain that falls on it and enters the lake, ready to enhance the growth of blue green algae. 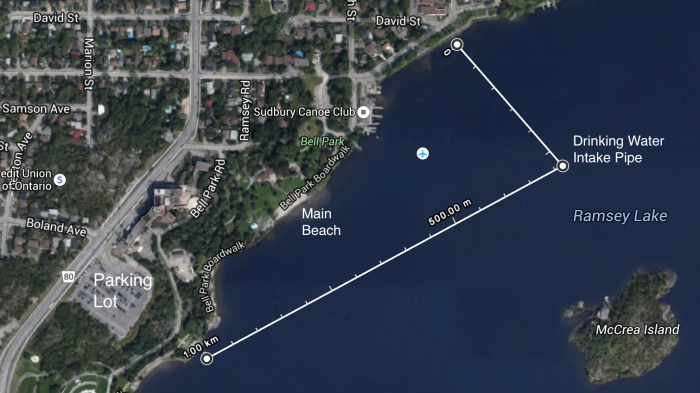 Can we afford to keep closing Ramsey Lake beaches every summer due to blue-green algae or E. coli? We have the perfect opportunity now to eliminate this source of pollution which affects Ramsey Lake. What should we do with this piece of land? Re-green it, of course! It’s what Sudbury is known for and we’re pretty good at it. The first step is to remove the already polluted asphalt. 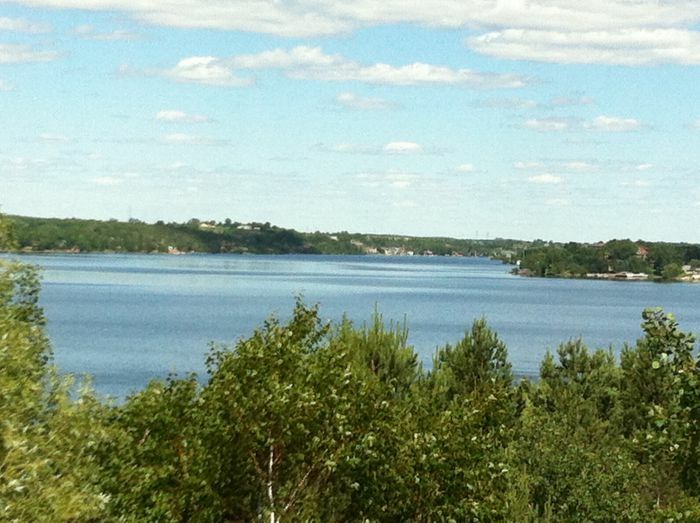 Once it’s gone, the community can be involved in the transformation of the land to create peaceful seating areas to view some of the best vistas of Ramsey Lake, and to install chess tables, outdoor physical activity equipment, or a rain garden feature with native species of trees and plants. And finally, we should erect a sign acknowledging that this re-greened, Bell Covenant land is important to the health of the lake and people of Greater Sudbury and it rests on traditional Anishinabek territory overlooking the lake originally named Bimitimagamasing or “water that lies on the side of the hill”. We don’t own the land. We are just stewards. Trusted by 1 other users.